Many years ago, I made my first Christmas pudding from a recipe in a foreign magazine. The result was everything the blurb promised – dark, moist, rich and very more-ish. I was delighted. Having grown up on Agatha Christie, I had finally made the steamed concoction that Christie occasionally referred to in her books. The pudding captivated me so much that the neuries, achappams and laddoos that I’d also grown up on, paled in comparison. Glace cherries, raisins, almonds and candied fruit being prepared for fruit cake. The rind and juice of orange and lime are also added. Pic: Theresa Varghese. Strange as these names may sound to those who associate the festival with cake, for many Indian Christians, Christmas has traditionally meant sweets particular to their region. Yes, there is cake, studded with fruit and laced with brandy. But there’s also guava cheese, coconut fudge, rose cookies, snowballs, etc, depending on which part of the country you come from. As Malayalis living in Mumbai, in my family there was the very Keralite achappam. But there were rava laddoos too, made the Maharashtrian way. There were also neurie, kulkul and diamond cut, courtesy the influence of the city’s considerably large Goan community. Neuries are similar to karanji of Maharashtra or kadabu of Karnataka. Kulkuls are made from dough consisting of flour, ghee, sugar and egg. Small pieces of dough are pressed onto the back of the fork, rolled up and deep fried, giving it a distinctive form. Diamond cuts are made from the same dough as kulkul, though some people will omit egg. The dough is rolled out into a sheet and cut diagonally. These ‘diamonds’ are then deep fried. To flambe means to pour a little alcohol over the food (in the case of pudding, it’s brandy) and set it alight. Once the alcohol evaporates, the flame goes out. Candied fruit is different from tutti frutti. While both are pieces of fruit, you get candied fruit whole such as a complete pear or a chunk of pumpkin marinated in sugar syrup, which you then cut up. Tutti frutti is already pre cut into small pieces and is dry not syrupy. Tutti frutti also has artificial colouring so my advice would be to avoid it. Every December, around the middle of the month, my mother would start her preparations with a trip to the grocer. Accompanying her, I watched fascinated, inhaling the aroma of grains, spices and condiments lying in sacks in the narrow, dark shop as she bought ingredients. The list was not overly long but the labour was. A working woman, she could only devote evenings to festive cooking, which sometimes meant staying up late at night. The whole family was involved, with us children doing the easier things such as rolling kulkuls off the tines of forks or shaping warm sticky rava into laddoos. Despite the repetitiveness the tasks entailed, it was fun. There was much bantering and the radio kept us company as we worked without pause. For the quantities made were large. There would be relatives and friends visiting, as well as neighbours and office colleagues to give to. Plus three children who behaved like bottomless pits. But there was never a Christmas when we did not have four to five kinds of sweet. Apart from the cake of course, which was usually a simple vanilla flavoured one. Now, when I chop vast quantities of candied fruit, raisins and nuts weeks ahead so that they can be steeped in brandy and fruit juice, I can understand why my mother opted to only give a cursory nod to the time honoured custom of fruit cake. How and why this kind of cake came to be associated with Christmas is attributed to Victorian England. During this period, a fruit cake covered with almond-sugar paste and topped by an icing made out of egg whites and powdered sugar became a table centrepiece. Before this, though fruit cake was around, it was not decorated. Neither was it eaten on Christmas day. That apparently happened when two customs merged. That of eating porridge on Christmas Eve. And having a cake with dry fruits and spices 10 days after Christmas when the season traditionally ended. Evidently, somebody hit upon the idea of jazzing up the cake and moving it to the festive day. Which was one smart move. Consider the two. On the one hand, a sweet confection, dripping with richness. On the other, stolid oatmeal. Which would you choose if you were celebrating? So a tradition came into being and travelled worldwide. Go to any department store or bakery in the city the week before Christmas and you will see both varieties – plain and decorated. Half kilo brick like blocks of fruit cake, as well as bigger white rounds of marzipan and royal icing cloaking the cake. With all the media hype surrounding fruit cake, it has remained front and centre commercially, with other treats receiving the cold shoulder. A few stores do stock items like kulkul and achappam but, on the whole, traditional favourites remain largely home made. And with fewer people now making time or taking the trouble to create such delicacies, there is the distinct possibility that in a few years the younger generation could well be asking ‘what is a neurie?’ But as times change, so do traditions. Look at the origins of the cake. The marinated fruit absorbs the flavour of brandy, juices and spices after it sits a while. Pic: Theresa Varghese. As for the pudding I embarked upon, the recipe that I had taken a copy of all those years ago remains with me, much used and dog eared. Not only has that one pudding multiplied into many to give relatives and friends, it has also ushered in a new family custom. Setting the pudding alight after Christmas dinner has become a much looked forward to practice in my home. Just as my tradition encompasses memories of the sweets we collectively made, hopefully my children’s will include a flambéed Christmas pudding and the warmth of a family sitting round a table to enjoy it. If you’re fretting about how to engage your kids during these year-end hols, don’t. Here’s a checklist of interesting things to do- mild, wild, fun and adventurous! 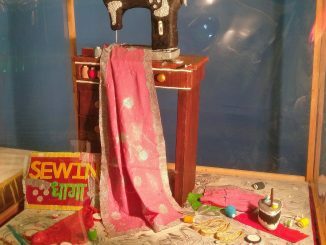 Be it Ranbir Singh or Sewing Dhaga or Red Fort, this cake exhibition has a place for everything. The designer sugary fabric adorns many of the pieces, as a testimony to the fine art of cake-making and innovation. Organising such a cake show isn’t a cakewalk. What goes into it? Take a peek into some unique traditions of Christmas in the city. From churches to bakeries to homes, the true spirit of Christmas can be seen everywhere.